The owner of Pfützenläufers Ares was so kind and provided us with a small report and a photo of Xaver on our homepage. Thank you very much for your help and cooperation. The report and the photo can be found under 'Progress reports: Pfützenläufers Ares'. Since there are common misunderstandings regarding tricuspid valve dysplasia and tricuspid insufficiency we have released a new chapter in which we show the difference between them. We hope to ensure that all ambiguities are eliminated. You will find the new chapter here (subvention 9). And once again, we had to expand our list of affected dogs to a male dog. In Pfützenläufers Ares (Xaver) tricuspid valve dysplasia was diagnosed on 23.12.2013 at the age of 12 months. We thank especially Xaver's owner, but also his breeder for their willingness to cooperate. The list of affected dogs can be found here. 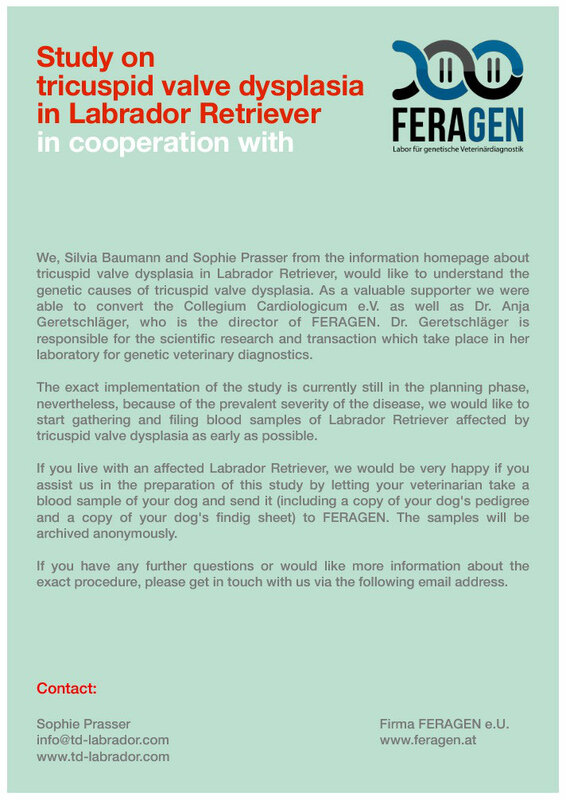 In the last edition of the club magazine of the LCD 'Unser Labrador', no. 119, a short report on the tricuspid valve dysplasia was published. Since this report does not describe the current situation sufficiently in our opinion, we would like to take stand to it. First of all, it is sure that it's not possible to make any statements about the frequency of occurrence of the tricuspid valve dysplasia at the present time, since (still ?!) no comprehensive resounds of many, if not all dogs takes place! How shall it be therefore fixed how many dogs are really affected or not, when a cardiac ultrasound only takes place at the whim or only (if at all) due to current symptoms? Even a high degree tricuspid valve dysplasia is not necessarily associated with noticeable symptoms (See. DRC, Bysterstorff's Beam me up Schröder, Level 3, assessment by breeding investigation by the Collegium Cardiologicum e.V.). Consequently, an assessment based on face validity can by no means suffice to make a statement about the incidence. Furthermore, in 'Unser Labrador' (March 2011) it is cited that the tricuspid valve dysplasia "according to the literature is a "classic" disease of the LR ..." , "... since these valvular deformity occurs regularly and this disposition has been described repeatedly ( Buchanan et al 1999; Famula et al 2002)". This view is also confirmed by all sources known to us. We welcome the fact that the LCD is concerned with the various heart diseases and observes their case numbers. For this reason we are seriously interested in knowing how the occupation with the problem exactly looks like. Are there considerations of sound duty as a condition for breeding? Are there considerations regarding the handling of parental animals or siblings of affected dogs? Are there efforts regarding the clarification of the possible genetic cause of the disease? However, we wonder also how is it possible to observe objectively at the present time the number of cases when 1) there is no comprehensive information on the possibility of an existing breed disposition which can't be definitely excluded at the present time and 2) it is decided individually a) to sound ones dog at all, and b) to notify the result of this sound to the clubs or to register in the database. The tricuspid valve dysplasia is, first of all, innate in any case, because it involves a malformation in the embryonic stage of development. Whether this congenital heart disease is even genetic, ie hereditary origin, can't be said with absolute certainty at present time, but there are already several sources* that describe a genetic (= hereditary) change (suspected on chromosome 9) as the cause of the tricuspid valve dysplasia. This was even said already in 'Unser Labrador' (March 2011). Further, in a study of Andelfinger et al. (2003) of tricuspid valve dysplasia in the Labrador Retriever was reported, that the tricuspid valve dysplasia is an autosomal recessive disease with incomplete penetrance. This means that it needs first 2 defective genes, so that the disease breaks out genotypical, in which case at an incomplete penetrance the characteristics of the associated phenotype despite the presence of genotype is not necessarily manifested. Thus it's self-explanatory that (in such an inheritance), the parents of an affected offspring are themselves genotypic carrier or affected, but may be phenotypically free. Whether this really applies to the tricuspid valve dysplasia or not or if it is actually a disease with hereditary origin at all, can only be proven by collecting the genetic material of as many affected dogs as possible and by specific examination in a subsequent study. That there can also be various causes for the emergence of tricuspid valve dysplasia, is so far only indicated in any of the corresponding sources. * Database of hereditary diseases in dogs (CIDD) of the University of Prince Edward Iceland, Canada; Database of genetic diseases in dogs of the University of Cambridge - Cambridge Veterinary School; Study of Andelfinger et al. (2003): Canine tricuspid valve malformation, a model of human Ebstein anomaly, maps to dog chromosome 9. If it is reported that the whole environment of an affected dog was examined and classified as healthy, the question arises to us how exactly these dogs were examined. Since there is no genetic test (yet!) for tricuspid valve dysplasia, it can be at best ultrasounds. However, as just explained, you can not imply its genotype of the phenotypic health of the dog. So how wants to put his hand into fire for that the inconspicuous sounded dogs still carry the potentially responsible genetic modification that can definitely not be excluded at this point (see previous paragraph) in them?! When it is reported further that at this very dog a protracted infection is believed as the cause of the tricuspid valve dysplasia, we are very interested in who says at this point of a protracted infection as the cause ?! A cardiologist of Collegium Cardiologicum e.V., a special veterinarian, a general practicioner, ...? At this point, a minimum level of scientific demand without concrete use statements and sources is not given. Furthermore, the tricuspid valve dysplasia is as already mentioned by all our known sources (incl. several cardiologists and a board member of the Collegium Cardiologicum e.V.) defined as a congenital and not acquired heart disease. This is also shown like this already in 'Unser Labrador' (Issue March 2011). The equivalent in humans Ebstein's anomaly / disease Ebstein is without doubt defined as a congenital (rather than acquired!) disease. Additionally, an inflammation of the tricuspid valve (endocarditis) can not make up the typical for a tricuspid valve dysplasia change with buckled flap ends and / or change in position of the flaps. And even that might occur at the age tricuspid-endocardiosis (which is a degenerative disease) is different than a tricuspid valve dysplasia (both we have got confirmed in a writing to us by a member of the board of Collegium Cardiologicum e.V.). So it would interest us even more, who has established the presumption of protracted infection as the cause. We agree wholeheartedly that it is quite reasonable for the aggressive handling of this disease, to first investigate as many related dogs as possible. So we see ourselves – due to the quite limited gene pool with breeding of Labrador Retrievers with LCD, DRC and generally FCI – in our call for a precautionary sound duty of the heart of all breeding dogs and, if possible, their offspring and other efforts to causal elucidation of this disease more than ever confirmed. Stating that the data provided previously from Dr. Kresken from Collegium Cardiologicum e.V. show no significant increase of affected dogs, raises several questions for us. First of all, we would like to know, how much data was provided and on the other, who and what criteria judges about from how many affected dogs there is reason for concern, or at least the need of targeted investigation. Furthermore, we need to take this opportunity to point out once again that – with the currently not existing obligation of heart examination – only a minimal fraction of usable data is provided with security. Additionally, it is possible that there are numerous dogs which carry the potentially responsible genetic modification in them and sharing in the case of breeding without being ill phenotypically themselves. Finally, we think, regarding the mostly very high grade disease, you should spend less time hoping and instead invest more energy in cooperation regarding to the causal elucidation of this disease. As long as regarding the tricuspid valve dysplasia, according numerous sources, the reasoned assumption of hereditary disease can not be unequivocally excluded, both the club and their breeders should see themselves in the role of educators for the numerous following breeders and their buyers. Fortunately, there are already a few breeders who have a precautionary sound of their breeding dogs and recommend this also urgently to the owners of their offsprings. We want to express our special thanks to these breeders. Nevertheless, the club should be first of all in the responsibility to sound all his breeders precautionary. In this currently very unclear situation about the exact cause of this disease, it can not be left up to you to provide the necessary education or not. Especially because even by the breeding examination, there is no given recommendation regarding the suitability of breeding dogs by the Collegium Cardiologicum e.V. This lies also only in the hands of the association even with existing results. Furthermore, the club should be interested in long or short term on the causal elucidation of these heart disease. Clarifying the question whether the tricuspid valve dysplasia is actually a genetic defect (suspected on chromosome 9) and if so, where and especially how exactly this genetic evolve should be of high priority. This can be, as already mentioned, however, only be achieved by collecting genetic material in n the form of blood tests from as many affected dogs as possible and examining them specifically with regard to the cause of the disease. At this point one should also remember that the highly affected dogs may not live long, so that the corresponding blood samples should be taken as soon as possible. We are already in contact with a laboratory for veterinary pathological diagnosist, which has shown great interest in such an investigation. But finally it is again significant that initially as many dogs will be sounded as possible to receive the corresponding data. Parallel to these considerations, the club should clarify the question of how to deal with already affected dogs, their parents and siblings. In our opinion, an occurance of the disease of 'level 2' or 'level 3' should definitely lead (after breeding investigation by the Collegium Cardiologicum) to disqualifying of the concerned dog. It would be best, of course, allow only dogs with 'level 0' for breeding. To what extent the admission of dogs with 'level 1' and their exclusive mating with dogs with 'level 0' is acceptable, would have to be tested through controlled breeding experiments. All results should be completely recorded in the index of the dog in the database of the relevant association. Furthermore, it should be taken care that all siblings of an affected dog will also be examined cardiology comprehensively. A regulation regarding the parents and the siblings of affected dogs, should be discussed, in our opinion, similar to epilepsy control of the DRC (Zuchtordnung für Labrador Retriever des Deutschen Retriever Club e.V., §3(13)). And even if it should turn out that the tricuspid valve dysplasia in the Labrador Retriever is not a genetic pedigree disposition (which is, as already repeatedly mentioned, not confirmed at the present time), there are at least some other heart diseases in Labrador Retriever (aortic stenosis , dilated cardiomyopathy, pericardial effusion, ...), which have, including the tricuspid valve dysplasia, negative effect at least on the health and quality of the life of the concerned dog. And not only that, but the owners of these affected dogs see themselves forced to face both emotional and financial burdens. And it can not be that one can breed with a dog, without knowing anything about his heart health (whether acquired, innate or even hereditary). Whether or not there are dispositions, a comprehensive examination of the heart should be granted before the breeding license. After all, it is about the heart, the engine of life. And once again we had to expand our list of affected dogs to a male dog (It's Sir Topi from Boyer Moor), which unfortunately had to be euthanized at the age of less than 8 months due to the severity of his condition. We want to hank Topis' owner for their trust and permission to put it on our list. And once again, we had to expand our list of affected dogs to a very young male, Dream of Nature Cody. We are very grateful for the openness of the owners, who are also the breeders, and for the permission to put Cody on our list. You can find the list here. And again, we had to put another dog on our list. Also Franconian Nobody is Perfect (Noby) was euthanized at the age of just 15 months due to the severity. We have updated and, thanks to a statement of the 1st Chairman of the Collegium Cardiologicum e.V., finally clarified how the "level 0" report must be understood. You will find the explanations here. Besides, we had to put also the brother of Krissy of Daydreams Delight Kimi on our list. Unfortunately, Kimi had to be euthanized at the age of just over a year due to the severity of his TD and the already resulting ascites in November 2011. We are very grateful that we have nevertheless go consent from Kimi's owner because Kimi's example clearly shows how dangerous this heart disease is! You can find the list here. Our Homepage has a new sub-item: 'recommendation for the heart ultrasound'. You can find it here. Also, at 'tricuspid valve dysplasia – Comparison of a healthy dog with a high degree cvd-sick dog' you can see now the impact of the disease by a report comparison of a free sounded and a severely diseased dog based on the retrace of clinical values. Today we have received a praise from the Retriever Club Switzerland for our informative homepage and the request to mention the RCS there. Of course we will do so happily! Just 5 weeks after publication of our site, we had to extend the list of affected dogs to a Labrador Retriever! We feel sorry for Krissy of Daydreams Delight (Emma) and her family, we know best how painful this diagnosis is. The list of affected dogs can be found here. We have updated our page including a chapter on pharmacotherapy. You can find it here (lower part). We start our activities on tricuspid valve dysplasia in Labrador Retriever and hope to contribute with our homepage to its study and to educate about it comprehensively.